You’re looking for one person tents, so you’re either gearing up for an awesome solo adventure or embarking on a fun trip with friends or family, but enjoy your privacy! If it’s time for a new tent, or you have no idea what to look for, you’ve come to the right place. Our experts researched more than twenty options to bring you a list of the top ten best one person tents! All you need to do is relax and review our tent buying guide from the comfort of your couch. Before we get to the tents, let’s check out some specifications to keep in mind, while shopping. Material: Check this spec to determine what each model is made from. 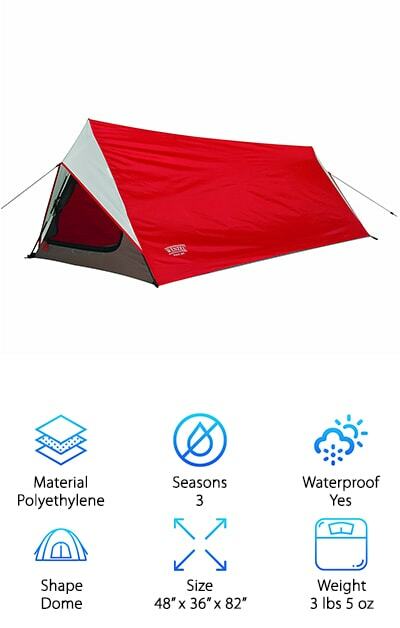 The material of the tent provides a good idea of how durable it is and how well it stands up to different weather conditions, depending on your needs. 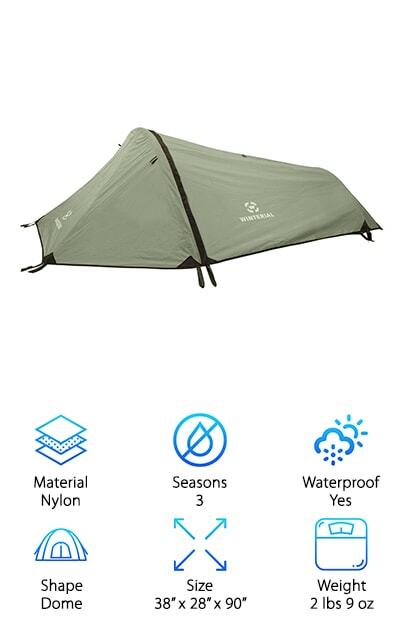 Seasons: Not every tent is made to withstand the same elements. Whether you’re seeking the best solo tent for a summer trip or you need an ultralight 1 person tent for backpacking through cold mountains, check here to determine if the model you like is a fit. Waterproof: No one likes getting caught in the rain. We’ll let you know if the model you’re eyeing is waterproof. Depending on your planned use for the tent, this is important and could be the difference between a successful and failed trip! Shape: Shape may matter to you, especially if you plan to stand up in your tent. Cabin, dome, or specialty shape, we’ve broken down how each tent is designed in this spec, so you’re sure to end up with the perfect model for you. 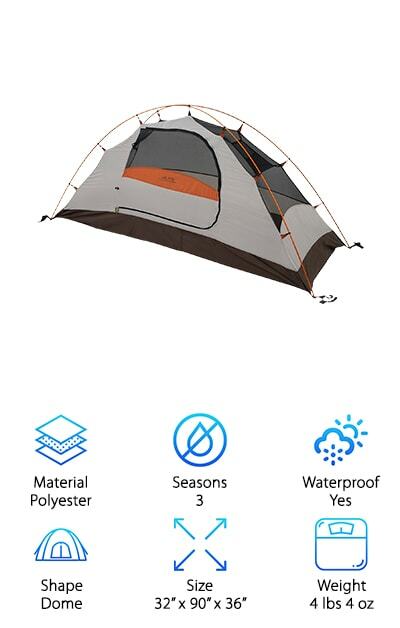 Size: Whether a lot of space is ideal or you just want a small tent to keep you warm and snug, check this spec to determine the dimensions for each design. Length by width by height will give you a good idea of the amount of room available for you to sleep and store your goods. Weight: How much can you carry? This spec will let you know how much each tent weighs. We don’t want you to end up with something that becomes a burden on your trip, especially if you’re in the market for the best one man tent for backpacking! We’ve given you a good idea of what to look for while shopping. Below you’ll find ten brands and designs-- all of which are top quality products with unique and beneficial features. If you don’t have time to browse them all, check out our top and budget picks first. Each option was carefully selected, based on one person tent reviews, so whichever you make your selection, you know you’re getting all the bang for your buck! Let’s get started! Our top pick for the best one person tent is the ALPS Mountaineering Lynx. Supported by strong aluminum poles and pole clips that snap quickly into place, this free-standing design is easy to assemble. This is great news for solo travelers! 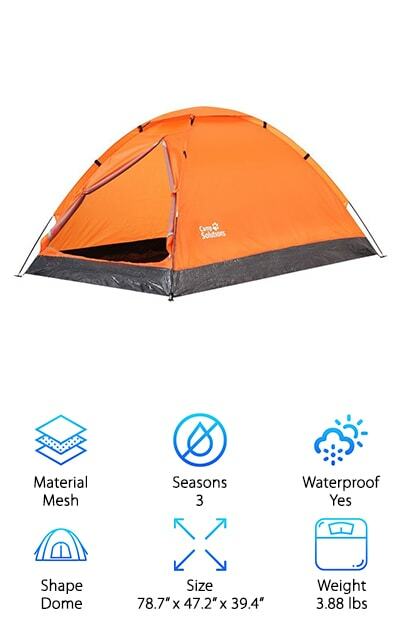 Made from mesh for ultimate breathability and polyester with a UV protective layer, this tent is built to last and protect you from the rain, wind, and sun. It is equipped with durable zippers and a poly taffeta floor that keeps water and moisture away, so you can relax and sleep comfortably. In fact, the rain doesn’t stand a chance against this model, thanks to its factory-sealed fly and floor seams that provide added protection against the elements. While you’re inside, take advantage of the inside pocket, which is elevated, so as not to take up valuable floor space, and perfect for storing your goods. Enough space for a tall person and a hiking pack, we think the ALPS is the perfect pick for your next adventure! Available in four fun colors, the Lucky Bums Portable tent is perfect for playtime or camping in the yard! Able to sit several children at once inside, or sleep one to two children comfortably, our budget pick is great for parents seeking a lightweight tent for their kids to use for outdoor fun or in the living room. Easy to set up in under thirty seconds, the Lucky Bums pops up for playtime and then collapses back down when it’s time to put away. It stores easily, too, as a thin design folded in half into a disc shape. Spend a night under the stars with your kids! The nifty mosquito netting will keep you safe from pesky bugs and the included stakes allow you to secure this tent to the ground, for protection against the wind. Or let them “build a fort” for movie night in your family room! The tent is also an ideal companion for festivals and concerts. Win the approval of the whole family with the Lucky Bums! If you need the best one person backpacking tent, you’re in the right place! 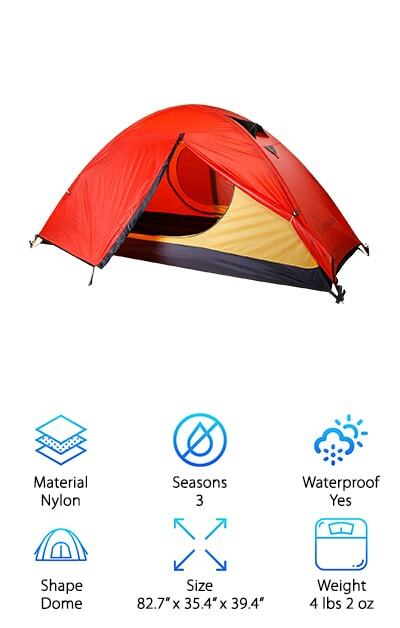 The Winterial weighs just over three pounds, so you can pack this tent up and bring it with you anywhere you go! You don’t want to spend your next vacation bogged down by a complicated, heavy shelter, but you also don’t want to compromise when it comes to all the best features. The good news is: you don’t have to! The Winterial features a ventilated mesh roof with a full coverage rainfly that keeps the elements at bay, so you stay warm and dry! A large zippered door provides easy access in and out. With plenty of room for you and your pack, and a convenient pocket to store your valuables, this tent has all the bells and whistles. Even better? It is simple to set up, thanks to a two-hoop design, and comes complete with three bundles of rope and 14 heavy duty stakes to firmly secure it to the ground. Come sun, wind, or rain, you’ll be ready with the Winterial! If you’re looking for the best ultralight solo tent, look no further. TETON brings you a premium model with a spacious design meant for one person and easy to carry on the trails at just over three pounds! 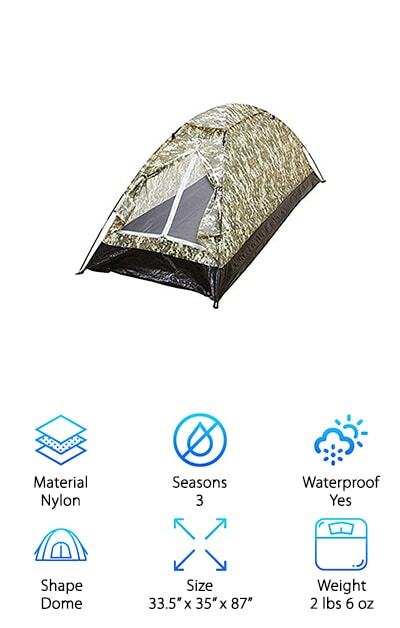 Made with durable nylon and micro-mesh that keeps the bugs out, you enjoy excellent ventilation and the option to stargaze through the screen. The rainfly keeps you safe during wind and rain and a 150D Oxford footprint is included to keep your tent in excellent condition, regardless of the terrain where you set up. The extra-high waterproof bathtub floor and reinforced, heat-taped seams ensure that water flow stays outside, so you can rest comfortably in a warm, dry environment. And here’s the kicker: this awesome tent basically sets itself up, thanks to a one-pole design! When the party is over, simply pack it down tight into a portable case. Your next adventure awaits and TETON wants to come with you! Made from welded polyethylene and constructed into a basic design, the Wenzel Startlight is your choice for a classic camping tent. 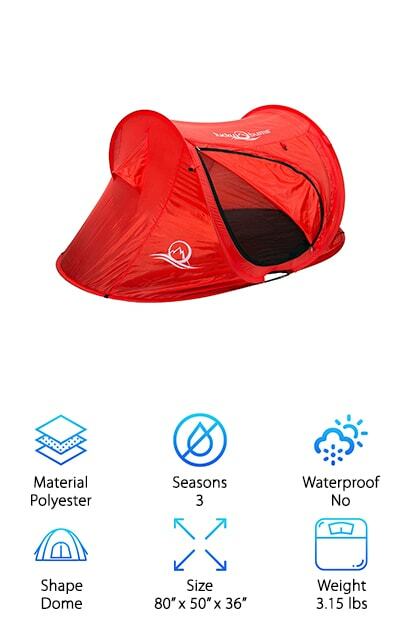 Complete with an easy access “D” shaped door and a mesh back window for ventilation, this simple tent is great for folks who like to be as close to nature as possible. Waterproof and durable, the Wenzel has all the necessary features to be a great outdoor pick but sticks to basics in every other way. Perfect for the budget-conscious outdoorsman (or woman), this tent weighs a mere 3 lbs 5 oz, so it’s easy to carry along the trails. It also features shock-coded fiberglass poles for a simple set-up, reaching a peak height of 36 inches. One door and one window allow you to gaze up at the sky and enjoy excellent airflow. If you’re looking for a traditional tent that comes equipped with a little modern convenience, then look no further! The Wenzel has you covered (pun intended)! You have a special connection to the great outdoors, but that doesn’t mean you want to sleep in it. We think we found the best solo backpacking tent in the Archer Outdoor model. This luxury tent looks as good as it feels-- and it feels pretty darn good! 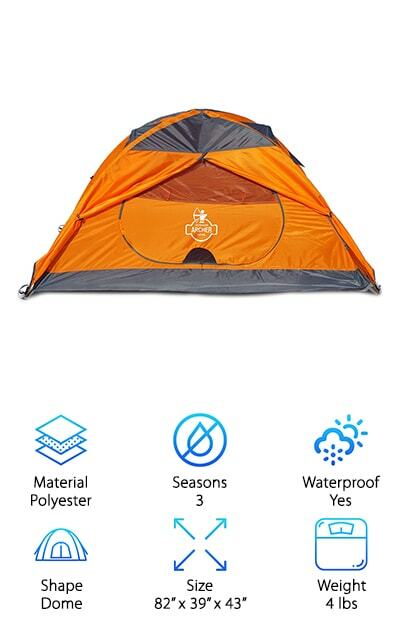 Spacious and private, this tent has all the features any adventurer could need. A 190T polyester shell is designed to protect you from the wind and rain while providing plenty of privacy. 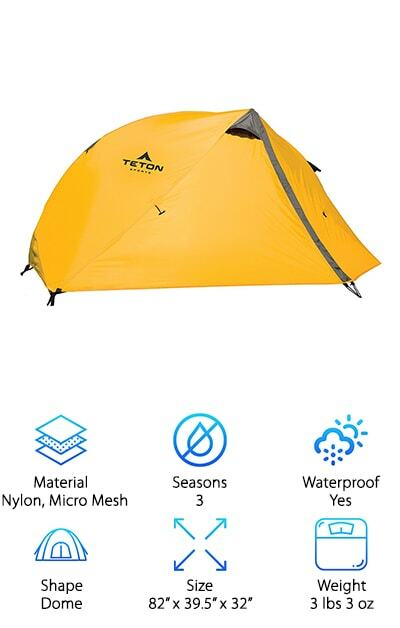 A rugged nylon bottom provides the ultimate protection against water flow entering the tent or rips and tears that could expose you to uncomfortable elements and bugs. The mesh and polyester work together to shield you from insects on the top end, too. Best of all, this premium tent is designed for easy set-up, so that a single person can pop it and take it down without added strife. It comes complete with its own pegs, wind ropes, and storage bag, too! Hunters take notice! The BNF USA Maxam Tent comes in camouflage, so you remain undetected-- even while sleeping! Designed to be spacious and extra long to accommodate taller occupants, this tent weighs just 2 lbs 6 oz. and folds up to fit in a convenient carrying case. Made from durable nylon, with a waterproof bottom, the BNF keeps you dry and away from the rain and water flow. A mesh door with a detachable rain fly gives the option of enjoying the breeze or hunkering down in bad weather. 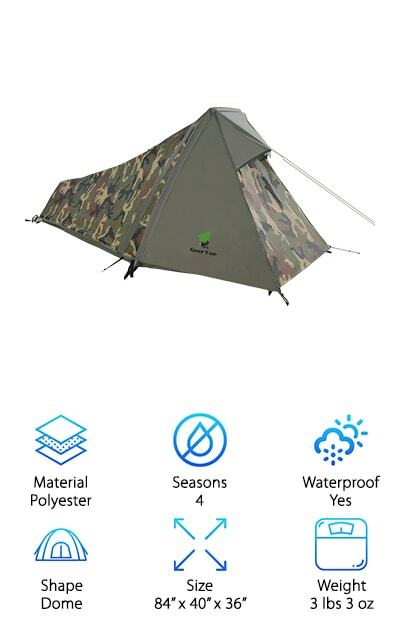 The many features and stealthy look of this tent make it our affordable pick for the best 1 person tent for outdoor enthusiasts who like to hunt or fish. Made with a polyurethane coating, fiberglass poles, and metal door connectors in addition to the zippered mesh, the BNF comes with its own metal tent stakes for easy set-up. Perfect for anyone who spends time outdoors, camping or hunting, the GEERTOP is a professional-grade tent designed to withstand all four seasons and last. It features a flysheet cover that protects it from the elements and tape-sealed, double-stitched seams that keep water out, so you stay dry. Lightweight, strong aluminum poles hold this tent in place and keep it secure during poor weather. Perfect for cold and wet conditions, the GEERTOP also features two windows for ventilation, so you are sure to get good airflow and a cooling effect in the summer months. The windows are made from mesh that keeps bugs out, so you can sleep easy without any nuisances buzzing around your ears. And get this: reflective materials keep you visible and safe at night. But it gets even better: this premium camping tent is light and portable, so you can put it right in your backpack during your next adventure. Our next pick is a seriously awesome tent. Not only does it feature all the necessary bells and whistles that any avid camper would desire, it also has a number of unique and useful elements sure to delight a rugged enthusiast and a novice alike! Made from nylon with a silicone waterproof coating that also reflects and absorbs UV light, the Wolfwise stands up to most weather conditions. Taped stitching keeps you warm and dry, while the tight mesh windows and roof keep the bugs out during warmer weather when you open the rainfly for a breeze. Anti-corrosive aluminum poles hold this durable tent up and provide a sturdy structure for you to relax in. All of these valuable features make the Wolfwise one of our top picks for the best single person tent, but it gets even better! Innovative fluorescent buckle straps on the zippered door make coming and going easy at night! And an interior mesh pocket and top hook for hanging a lantern keep this model super practical inside. Best of all, it’s designed to be set up easily by one person! A lightweight, waterproof tent perfect for a camping or hiking excursion, the Camp Solutions Folding Tent is easy to assemble and even works as a freestanding model! Supported by two lightweight aluminum poles, mesh walls with a door and vestibule complete the simple design and provide great ventilation. A factory-sealed rain fly and floor seam keep you dry, even during a rainstorm, making this tent a valuable option during warm or chilly, wet weather. When your trip is over, simply fold this easy-to-assemble design up and put it in its convenient carrying case for portability. Complete with fiberglass rods, guy ropes, a mesh storage pocket, and a gear loft, we think this deluxe model rounds out our list as a top contender for the best one man tent. And here’s the kicker: you can have it all at an extremely affordable price that won’t break the bank. Don’t waste time and start your next adventure now with the Camp Solutions!